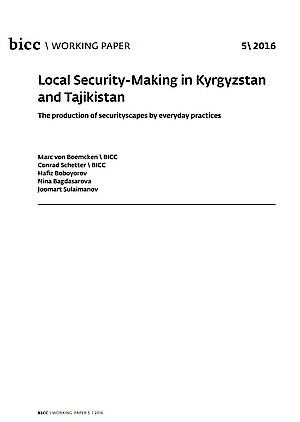 In cooperation with researchers in Tajikistan and Kyrgyzstan, BICC (Bonn International Center for Conversion) is conducting a three-year research project on everyday security practices in Central Asia, which is funded by the Volkswagen Foundation. The project was launched in July 2015. While security has become an important focus of academic work on and in Central Asia, most studies highlight the geo-strategic importance of the region and underline the threats to states posed by non-state armed groups and transnational criminal organizations. The research project proposes a radically different approach to studying security in Central Asia. As a point of departure, it understands security as an everyday practice of people that consists in identifying and engaging perceptions of existential threat. It asks: How do various groups of people deal with security issues in their daily lives? For the purpose of addressing this question, it develops and applies the innovative concept of securityscapes, which is partly inspired by the work of the anthropologist Arjun Appadurai as well as recent debates in sociology and political science on studying security as a constitutive practice and in a less state-centric manner.